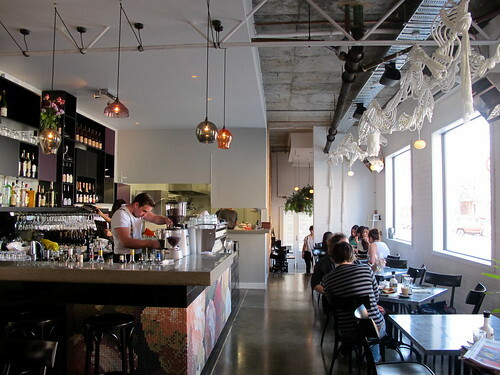 The Brix is the snappy new kid on the Brunswick Street block, run by Emma O’Mara and Keir Vaughan. 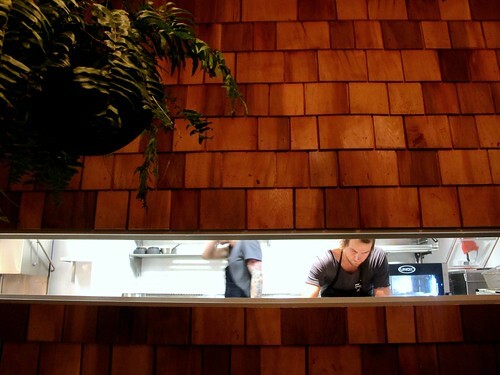 It's a modern French bistro, with ex-Royal Mail Hotel chefs Joel Alderson and Daniel Dobra in the kitchen. Ainslie Lubbock, also formerly at the Royal Mail and more recently at Attica, helped put the excellent wine list together. Emma's background in interior design has really paid dividends, particularly when you consider what the site looked like before. 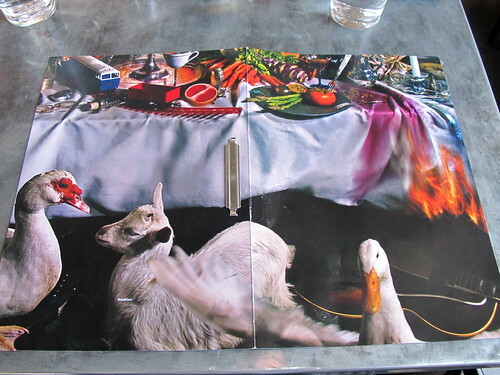 I went along with my housemate J on a Tuesday night not long after it had opened, when every second table seemed to be someone from the industry (I counted three local restaurateurs and one major newspaper restaurant critic). We were seated in the narrow vestibule dotted with hanging plants which links the main room to the outdoor courtyard. 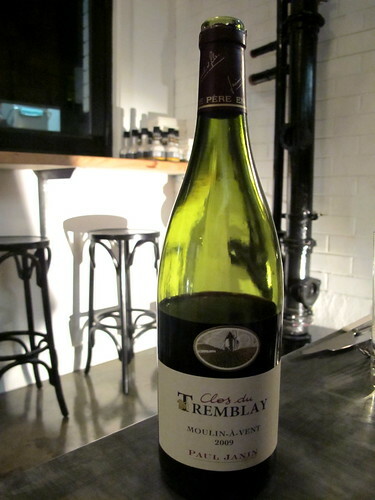 Over dinner we shared a bottle of 2009 Paul Janin et Fils Moulin-à-Vent Clos du Tremblay, a pleasantly chewy and weighty Gamay. The à la carte menu (which is available Tuesday-Thursday) is simple: five entrées, four mains and on the night we visited two specials. Unfortunately for my vegetarian housemate there was only one vegetarian dish listed (an entrée), but when we asked the kitchen was happy to prepare a vegetarian main for him. 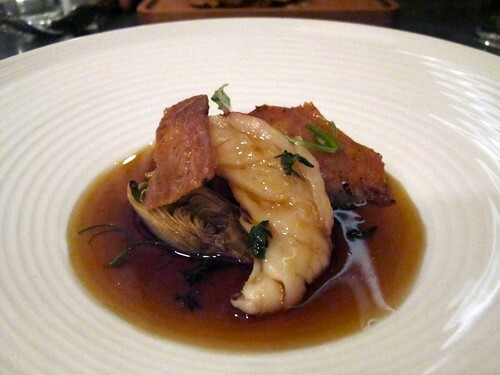 I had a sensational entrée special of marron poached in a rich and viscous roasted chicken broth, with very fresh roasted baby artichokes and tiles of crisp chicken skin ($17). 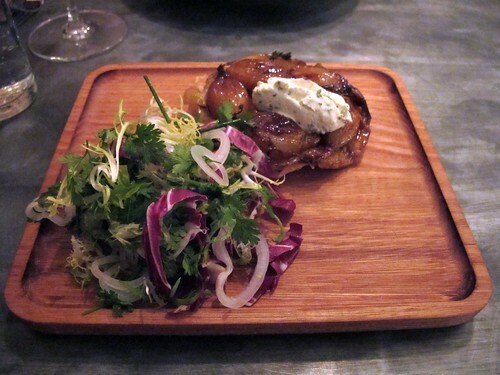 J had the equally good shallot and Banyuls caramel tarte tatin, which was served with a dollop of fromage blanc and a baby leaf salad ($15). The pastry was buttery and crisp on the bottom, and the sweet shallots were still a bit sharp. Great stuff. After a very very long wait between courses (hopefully just the teething problems of a new restaurant still finding its feet) our mains arrived. 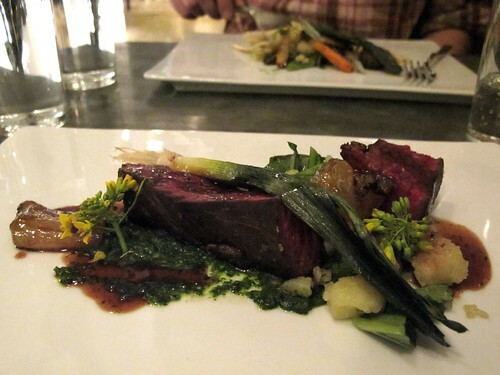 My main of roast beef came with smoked spring onion, leek, potato red wine and braised tendon ($32). Holy hell, the texture and concentrated flavour of those strips of mucilaginous tendon was pretty damn outrageous. J's off-the-menu vegetarian main consisted of smoked oven roasted vegetables, including heirloom carrots, spring onions, leeks and potatoes, served with a nettle sauce. He wasn't crazy about the nettle sauce, but really appreciated the quality of the young vegetables. 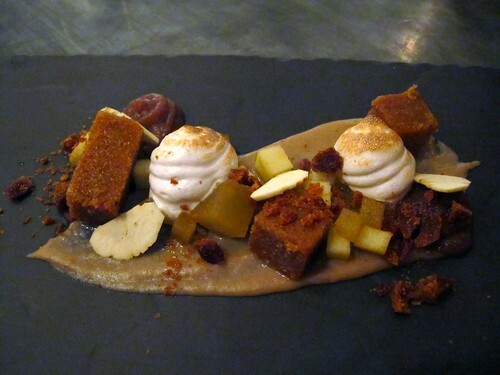 We shared a $14 dessert of chestnut, honey, apple and date, served in the deconstructed-mélange-of-flavours-and-textures style that's so popular these days. The chestnut purée was a winner, as were the supersoft apple meringue and chewy, candied date crumbs. We were split on the slivers of raw chestnut: J hated them, but I loved the dry crisp texture. I went back two weeks later with T and our friend F, cos I wanted to see it during daylight and to try out the breakfast menu. The space is even better looking during the day (as Essjay and Jess noted, it's no mean feat to get that much natural light into a narrow south facing room). 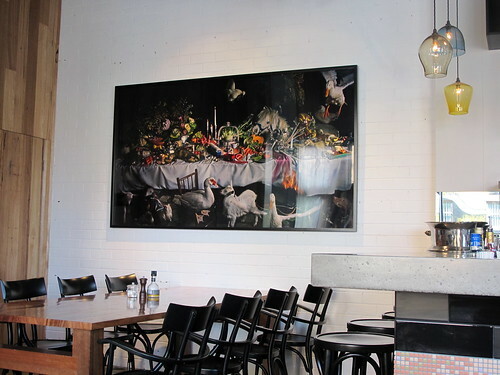 The menu cover reproduces a section of the remarkable commissioned painting on the north wall of the restaurant: it looks like one of those Dutch 17th century banquet still lifes, but updated with a few choice contemporary objects (like a toy train and an electric guitar). The aforementioned painting, in situ. 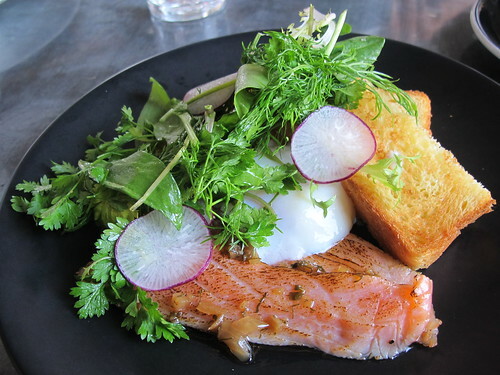 I ordered the cured ocean trout, which came with a zippy little sauce "bois bourdan" (I think it's meant to be "bois boudran", a shallot, worcestershire sauce, tabasco and fresh herb vinaigrette), and lovely soft coddled egg and brioche ($16). 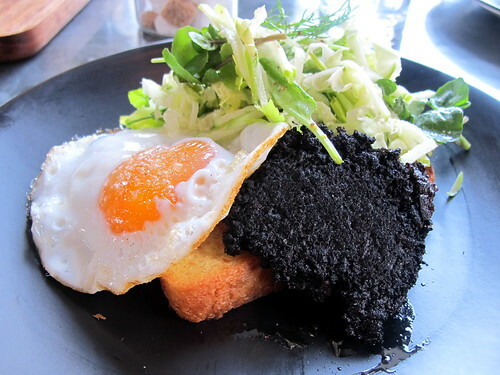 T got his protein and iron on with rich black pudding, fried duck egg, brioche and an apple, cider and sorrel salad ($16). 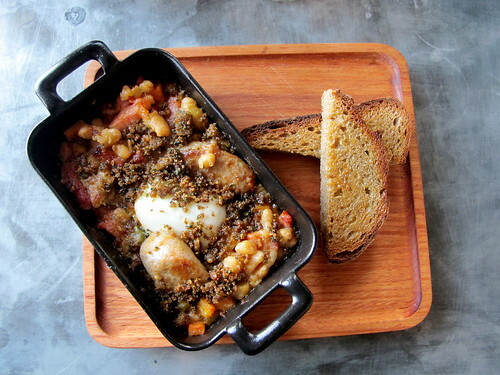 Our friend F (one of the 310Fitzroy crew - check out their brilliant new food blog here) ordered a dish you don't often see on a breakfast menu: pork cassoulet with baked egg, persillade and rye bread ($17). 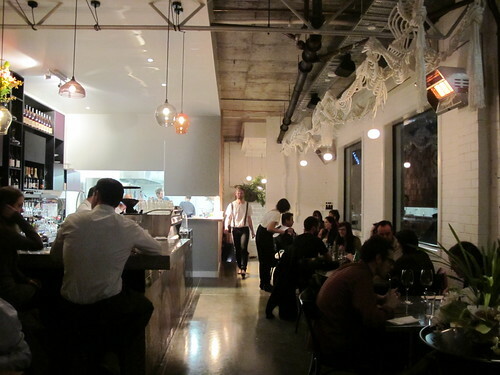 Having all the floor staff wear black skinny jeans, white shirts and braces is a little precious, but the space is brilliant and I love what I've seen so far from the menu and wine list. Particularly keen to go back in a few weeks to try the five course fixed price dinner ($80 per head) served on Friday and Saturday nights. Very promising, go check it out. 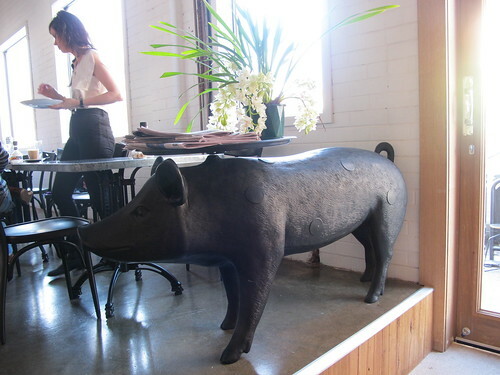 And be sure to give the life sized pig statue a pat on the way out. 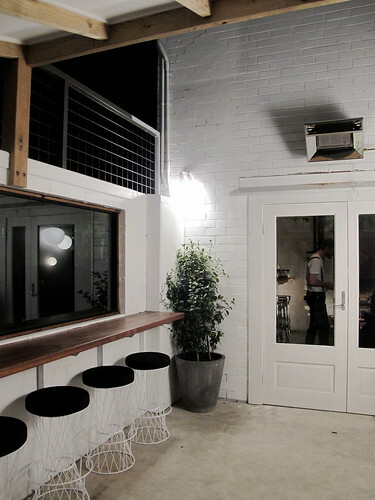 Places like this are why I am looking forward to moving home to Melbourne. Sounds great (although I agree the uniform is a little affected). Oh yeh - let me reinforce the Bloody Mary quality. They vacuum pack some tomatoes with some horseradish (infusing them in the process) and sous vide them a little bit. These are processed along with some tomotoe juice. YEs, teensy bit "affected" but so yum! The Horseradish flavour becomes more than justa "top note" aroma. Worth getting a ahngover for. WOWZERS, not only did the venue LOOK divine, the images of the food have me drooling! DELICIOUS!! I need that painting in my life. In some form or fashion at least.. I love the art. Quite unique.